The Faculty Library organizes and coordinates the collection with respect to the Faculty educational and scientific activities and involving the concerned parties. Procurement is based on the scope of collection stated in the Organizational and Operational Rules, on the required and selected bibliographies of courses in the annual schedule and on the demands of professors and students indicated directly to our librarians – always within the boundaries of the available budget, and occasionally through special tenders or donated gifts. The Library also observes world trends (traditional and digital, Hungarian and foreign documents). With its holdings the Library supports professors and students in better orientation, completing assignments and achieving personal accomplishments. In 1904 Gusztáv Szászy-Schwartz made a suggestion to establish the Faculty Library. Years later, in 1957, the Faculty Council decided to re-establish the collection. Building up the library started with the departmental (former seminar) documents, the so-called national book collection of the National Széchényi Library, and with buying antique and new books. 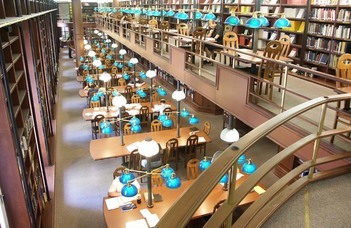 A 54-seat reading room was created from former lecture rooms on the ground floor of the Faculty. The University decided to extend the library in 1993. The collection has been moved to the first floor to an 18-seat makeshift reading room, the rest of the books were transferred to depositaries in Törökbálint and the construction started on the ground floor and in the contiguous basement storerooms. The reading room, with the adjoining rooms, workplaces and the depository was finished in the summer of 1998. The development of the Faculty Library to a research library started in 2010, and thus the acquisition policy has altered, collecting research guides and foreign language legal dictionaries has become a priority. The Faculty is constantly looking for new resources to continue adding to the collection. The Faculty Library collects and explores historical and recent handbooks, monographs, textbooks and periodicals of Hungarian legal and administrative sciences. It collects legal theory and legal history monographs and handbooks of states of the European law system as well as their statute books and periodicals in Hungarian, English. German, French. The library seeks to procure synoptic and most valuable works of related sciences such as philosophy, sociology, statistics, political sciences, Hungarian and world history. Bibliographies, encyclopedias, lexicons and dictionaries of the reference library support research and provide general information.